Leon Kossoff ‘A London Life’ at Piano Nobile opens today across their two spaces in Holland Park, their brand new gallery opposite their existing allowing for an expansive show of the artist’s work. For a private gallery this is a remarkable offering, with paintings and drawings of the finest calibre from the 1950s to the 1980s on view. The opening last night was very special, particularly due to the attendance of both the artist himself and his long-time friend and contemporary, Frank Auerbach. This impressive show features works from every stage of the artist’s career, works which all take his city as their subject, revealing a dialogue between the artist’s creative life and his surroundings. 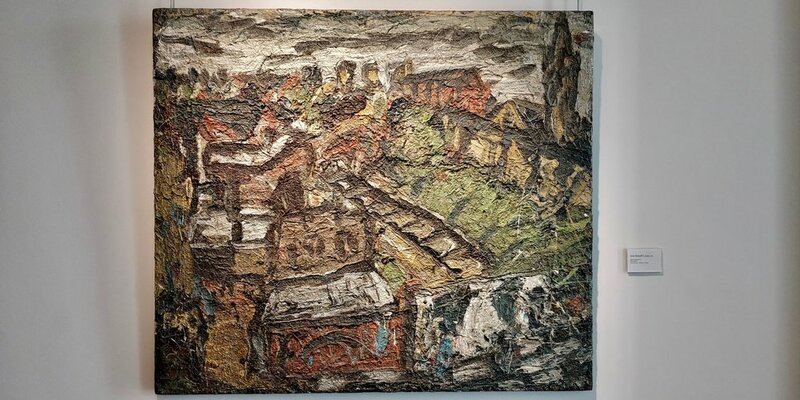 Kossoff’s interest in documenting the people and places that he encountered daily is here unambiguous. For Londoners, several familiar cityscapes can be found lying beneath the energetic brushstrokes loaded onto the canvas. Perhaps not instantly recognisable, these paintings successfully communicate the essence of the spaces they represent. Kossoff’s friends and family also play a principal role in his vision. The exhibition provides an insight into Kossoff’s personal and intimate relationships. Oil paintings of his brother, Chaim, and his model and friend, Fidelma, both long-standing subjects of his work, are included. When combined, both landscape and figure paintings create an irrefutable argument for Leon Kossoff’s place in the canon of modern master painters. Timothy Taylor will also dedicate a show to Kossoff and his London works. ‘Leon Kossoff: Everyday London’ will open at their New York gallery on March 29th. The show will present fifteen drawings selected from the artist’s studio. Spanning 60 years, each work exists as a contemporary snapshot, recording the pulse of everyday London.